A packed Minster Hall at the Allendale Centre in Wimborne recently saw an audience of nearly 300 people enjoy an evening of jazz. 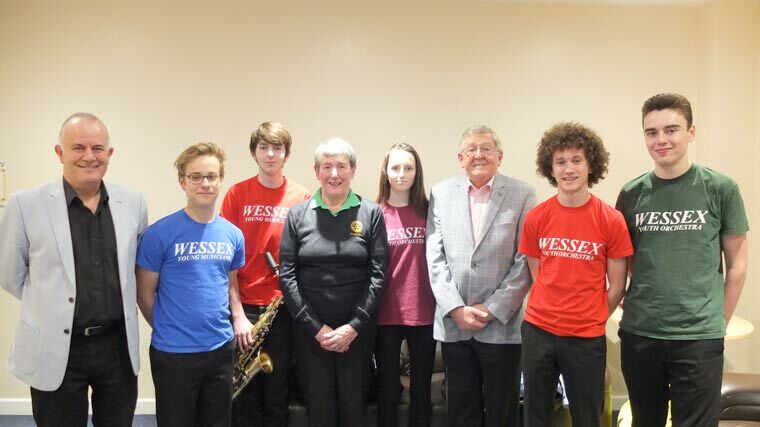 (L-R) Tony Waller , Leader of Bournemouth Jazz Orchestra, with young musicians, Reuben Gibbs, Sam Watkins, President of Wimborne Rotary, Sue Young, Harriet Rhind, Rotarian Darryl Reach who organised the event, Austin Carroll and Felix Turnbull. The concert was presented by the Bournemouth Jazz Orchestra under their leader Tony Waller. Organised by Wimborne Rotary in conjunction with their business partners and in support of the Centre for Wessex Young Musicians and Rotary charities, the evening raised £1,400 from a collection taken at the end of the concert. For five members of the Wessex Youth Orchestra, the evening saw them joining with the Bournemouth Jazz Orchestra to perform some numbers for the appreciative audience. The five were: Reuben Gibbs (Trumpet), Felix Turnbull (Trombone), Austin Carroll (Trumpet), Harriet Rhind (Percussion) and Sam Watkins (Saxaphone).